Introducing our Animal Characteristics (Vertebrate) Pack with tons of activity sets that will suite your young students' needs. This learning material is more than just sorting or matching activities. What we have in this learning pack are realistic illustrations of each characteristics for better retention of concepts and tons of hands-on learning opportunities for young students to work on. This Montessori Vertebrate Characteristics learning pack was basically designed for children ages 5 years and older. With this learning material, your students will be able to learn the characteristics of amphibians, mammals, reptiles, fish, and birds through visual representation and hands-on activities. There are 8 characteristics provided for each animal for you to explore. Nothing beats hands-on learning, but because we have no access to tadpoles and frogs, we just rely on books, educational toys and create meaningful materials to achieve the "hands-on experience". 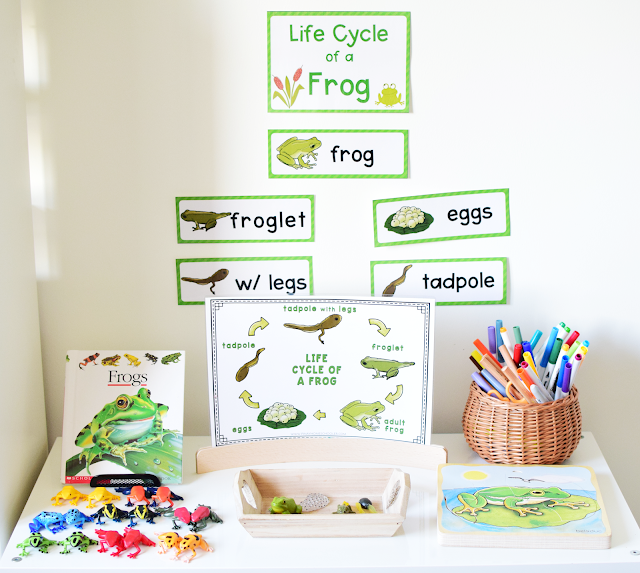 With the success of our Water Cycle activities (and the material has been a bestseller too), I made a similar learning pack for our frog life cycle. The learning pack is perfect for kids aging 4 years to 7 years old, something that will grow with your child through the years. It contains different activities for different stages of the child, all you needed to do is print the one that suits your needs. With Vito reading CVC words and sight words, we are now moving to the Blue Series. The Blue Series is a Montessori approach in learning consonant blends and digraphs. I made an entire set of blue series materials for Vito to use in the course of his learning. We will work on these materials and move on to the next set as he progresses. In this post, I will give you an overview of the materials and how we are going to use them. It is important to note that the blue series (blends and digraphs) comes after the pink series. Once the child is familiar with letter sounds and can basically read CVC words (pink series) then he/she can move on to the blue series. I'm so excited to share our St. Patrick's Day Mini Unit!!! I am so happy that you are loving ALL our MINI UNIT series and the FULL PRESCHOOL CENTERS!!! We've been working on these activities for years, way back when my eldest was in preschool but I didn't publish the printables in the shop back then. Now, I'm so happy to share them with you so you can enjoy the benefits of these as well. Without further ado, I would like to showcase our St. Patrick's Day Mini Unit, full of fun and engaging activities for preschoolers, pre-k and kindergarten kids. Included in this pack are activities that will let your child practice fine motor skills, alphabet tracing, hands-on math, and a lot more! For more St. Patrick's Day themed materials you can click here. Vito has been really interested in sharks lately. We had some Shark Unit Study (Montessori Inspired Shark Study for Kids) years ago together with my eldest, but Vito was so young then that all he could ever do was do some simple matching activity with our Safari Toob Sharks. Now that he's a bit older, I prepared some simple activities for him to learn more about sharks, what's their difference with whales, and how similar are they to humans. We love to travel and going to places, thus geography is very important in our homeschool and I make sure that we do continent and country studies yearly. Now, this is not the first time I introduced Vito to Asia. We've worked with a lot of continent activities before and because he is much older now and able to understand and grasp concepts, I reintroduced Asia once again. Below are some of the works we had for the past 2 weeks we spent on learning about Asia. It took us 2 weeks to finish because he got sick within the time frame so we paused in between. What I like about homeschooling is being able to make themed materials for my kids that will go along with a certain season or holiday. Because Valentine's Day is just around the corner, I made these beautiful and cute teddy and heart letter and number cards perfect for home and school settings. We use these types of learning cards in so many ways, and I have listed a few of those activities below for your reference. Enjoy! Here's a fun activity that Vito and I would do to practice identifying objects and their beginning letter sounds. I usually integrate this in our letter of the week activities or just play it on its own. Vito currently loves using our Golden Beads material. We are done with presentation of materials and have worked the layout (Montessori Decimal System with Golden Beads) as well (we will do this again) and now he enjoys playing the Bank Game. I have a growing list of autumn books which I’d like to share with you. This is a collection of fiction and non-fiction books, so they are perfect for kids of all ages. We read them day and night these days to understand and appreciate this beautiful season!